Google Analytics Solutions: Where Did My Paid Search Traffic Go? Where Did My Paid Search Traffic Go? Now let’s say we want to further drill down to see what portion of our traffic was driven through paid search traffic. To see this portion of search traffic, we can simply click on the “paid” link at the top left corner of the report. Which search engines do you see listed now? In this example, when we filter to view only paid traffic, all of the search engines except Google disappear from the list. Of course, this all would make perfect sense if you were only running paid search campaigns with Google. But if you also have active paid search campaigns with other engines, then you’re probably starting to wonder what happened to all those visitors you spent good money to attain! The key is understanding how Google Analytics interprets paid and non-paid keyword traffic. In short, all search engine traffic is classified as non-paid (aka, organic or natural search) traffic unless campaigns are specifically tagged to show up as paid. We make it easy for you to parse out your Google AdWords traffic by offering an auto-tagging option (visit this article in our Help Center for details if you aren’t doing this yet). But you need to make a little more effort if you want to see your other search engines’ paid traffic reported properly, through a process we refer to as “manual tagging”. To get started with the manual tagging process, our URL Builder tool comes in handy. 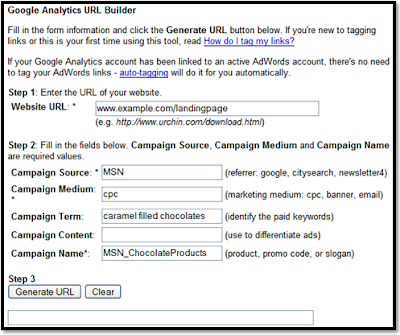 You can actually use this tool to generate URLs to track any online marketing campaign, but that’s a topic for another post. For paid search campaigns, the main thing to remember is that the campaign medium must be set to “cpc” or “ppc”. Imagine you are driving people to a landing page, www.example.com/landingpage and have a campaign to promote your delicious chocolate product line. Campaign source, medium and name are required parameters. The other two are optional, but to see the keywords, we’d recommend using the term parameter (in this case, “caramel filled chocolates”). You can be creative on most of these values, but you must use “cpc” or “ppc” in the campaign medium parameter for search traffic to be separated properly. 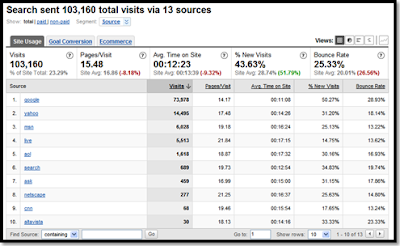 The Search Engines report in Google Analytics is very useful for seeing which search engines drove traffic to your site. In the report below, you can see that most of this sample website’s traffic is coming from Google, but Yahoo is driving a respectable number of visits (14,495 to be precise).